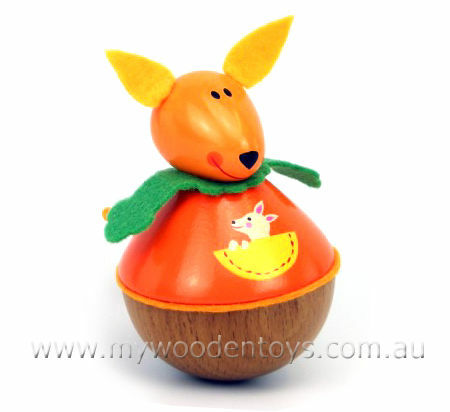 Wibbly Woobly Wooden Kangaroo Is a smiling happy toy with a beautifully finished natural and painted wooden body. This lovely toy rocks back and forth when it is pushed and is a great cause and effect toy for your little one. A very simple toy it provides great entertainment and when you have pushed it once and laughed as it wobbles you can do it again and again. Love the little touch of the painted Joey in mums pouch. For anyone who remembers "Weebles wobble but they don't fall down." this will bring back memories. We like this because: "Produces lots and lots of giggles."